Genius creates a new generation of personal peripherals. Are you the Smart Generation who goes for speed & efficiency? SmartGenius is the answer for your daily input. 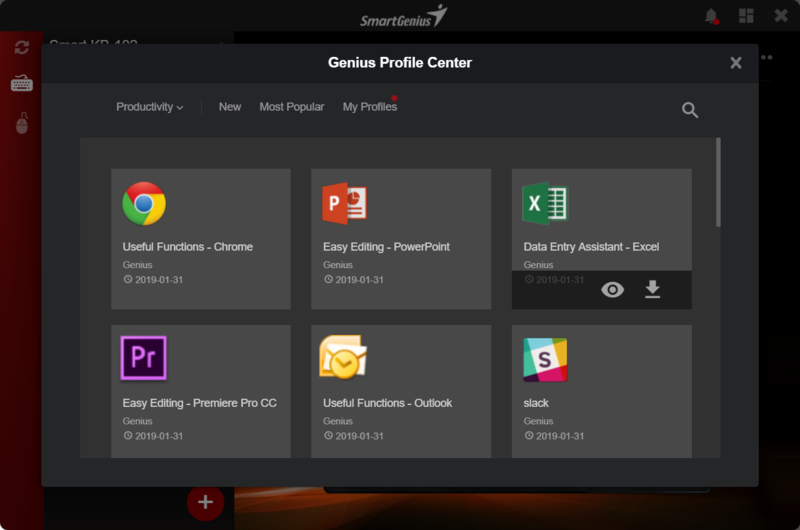 SmartGenius is a desktop application which empowers the Genius Smart Devices. It is working as a software engine to provide rich functionalities. 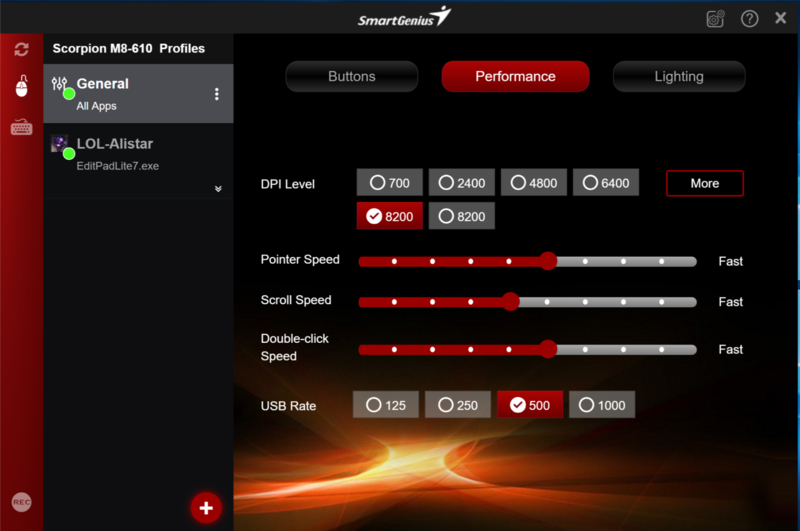 Users can managed / configure your Genius devices with the intuitive interface of SmartGenius. In this document, SmartGenius version 1.6 is referred. 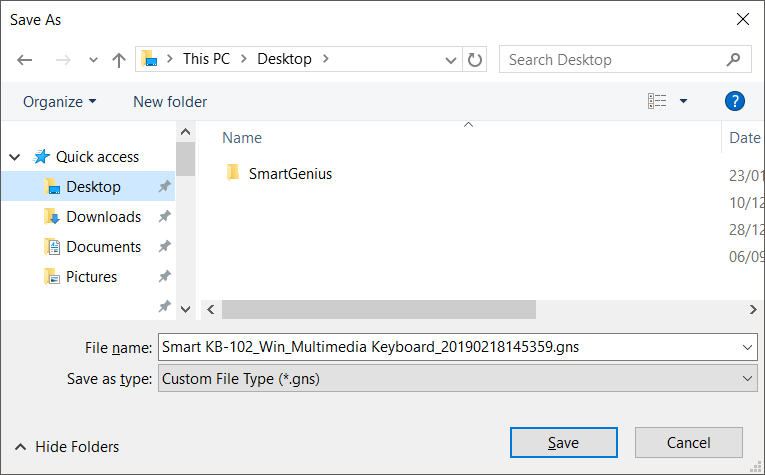 Note: SmartGenius is running in backend automatically when you start your computer so that you can benefit the efficiency from SmartGenius. Go to system tray (besides notification area of Taskbar) and drag SmartGenius icon into notification area. Connect your Genius Smart Keyboard / Mouse to your computer. SmartGenius will detect the Genius devices automatically. Genius Smart Keyboard is a new generation of keyboard. It is designed for the Smart Generation who goes for speed & efficiency. 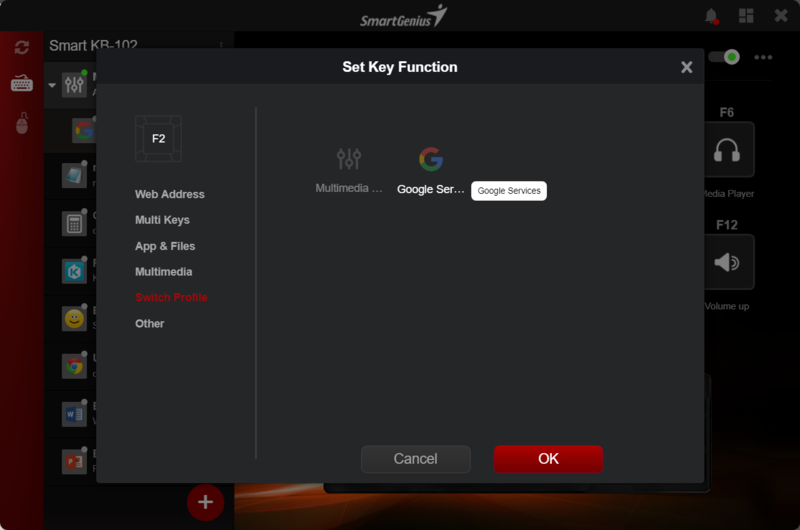 Just simply press the customizable Smart Function Keys to access any websites, apps, files, and commands for any application on your computer. 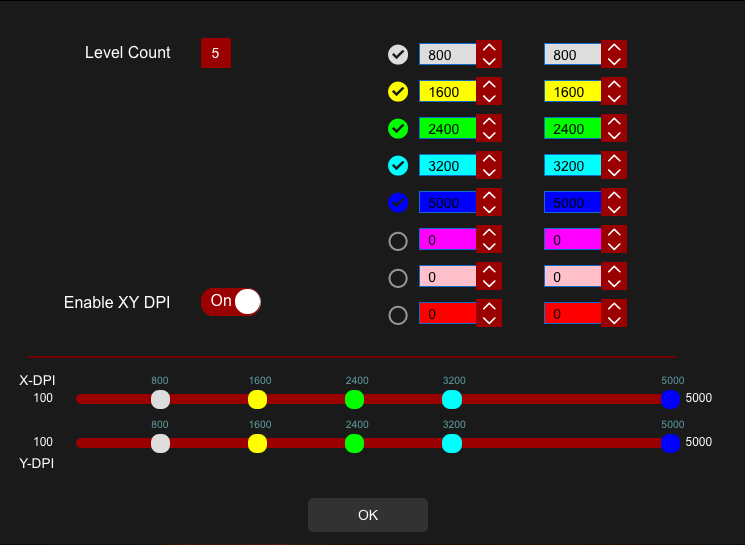 No more tedious input steps, your input efficiency will be greatly improved by at least 50% or more! Genius Key Bar: Press the Genius Key to open the on-screen virtual function keys panel. Visualize the current function of the Customizable Function Keys. 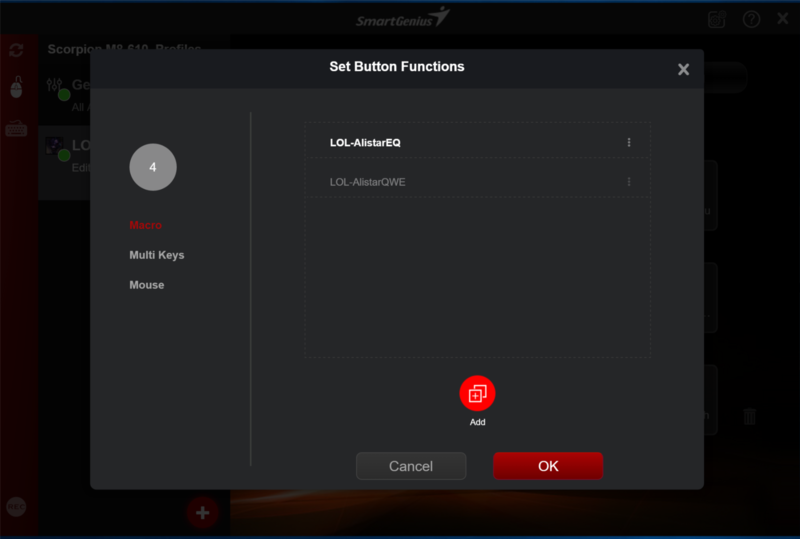 Customizable Smart Function Keys: input steps of your frequent tasks (like visiting webpage, using apps and files, calling a command of an app, etc) can be simplified. Now you can complete these tasks by simply pressing the Smart Function Keys. Smart-in-motion: Besides the general setting, you can have additional settings and link them to the apps you use. The app-specific setting will be activated automatically when the linked app is in use, and this is what we call Smart in Motion! 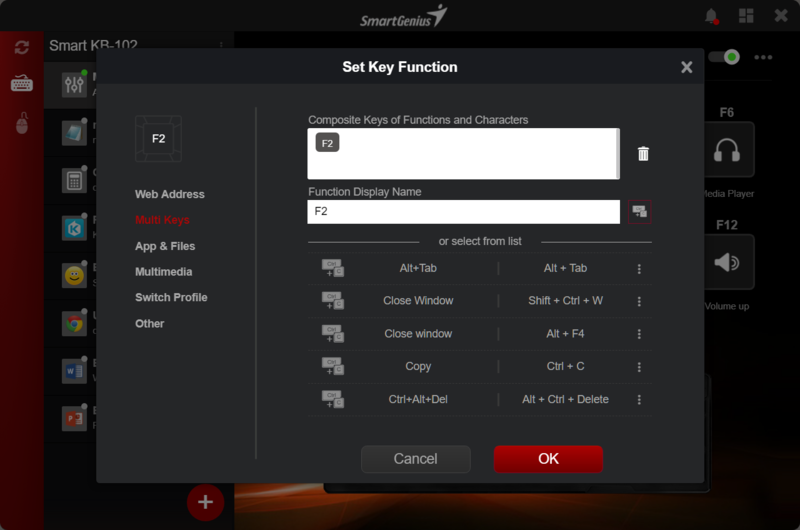 Press any of the Smart Function Keys (F1-F12) to execute its function. For example, by pressing F3, the Calculator App as shown in Genius Key Bar is launched. Press Settings icons on the Genius Key Bar to open the SmartGenius app for configuration. 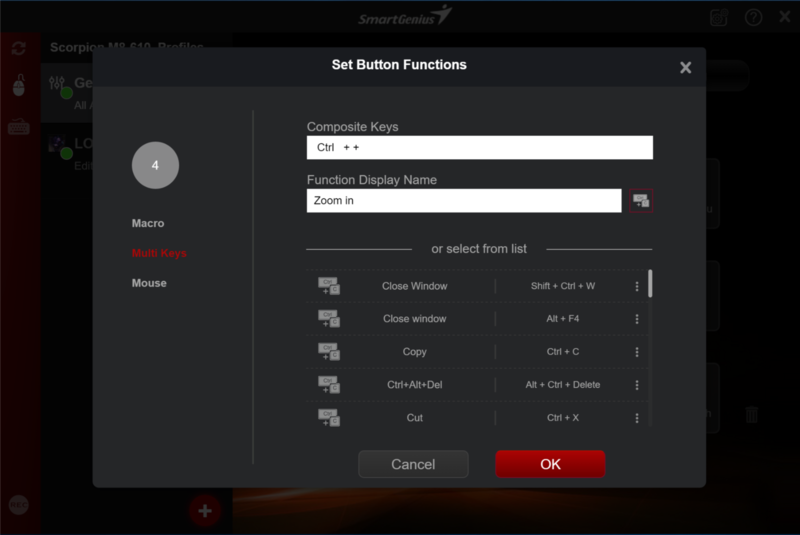 Click the setting icon on the Key Bar or click on the SmartGenius icon to go to the main page of the SmartGenius app. Move your mouse to click on the Web Address option on the left panel. Move your mouse to click on a function key icon (for example, F2) to open the Set Key Function window. 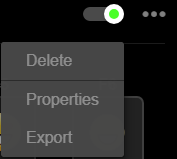 Move your mouse to click on the App and Files function option on the left panel. Click the browse icon to select the file you want to add to the Smart Function Key. 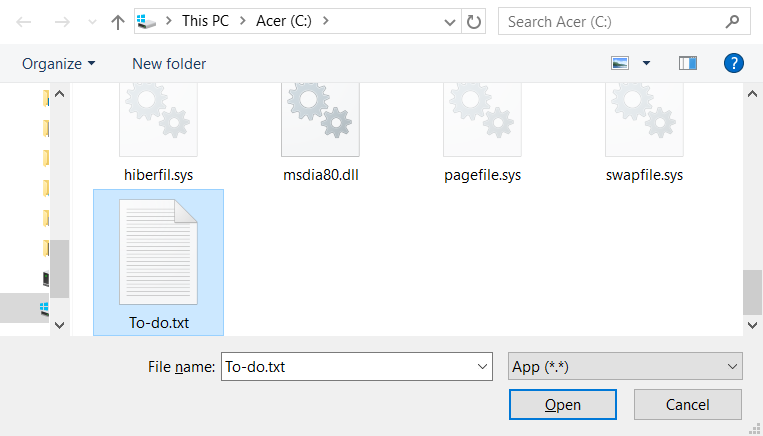 Select a file on your computer, any document file can be selected. Now go press the physical key F2 on your keyboard to open your frequently used file. 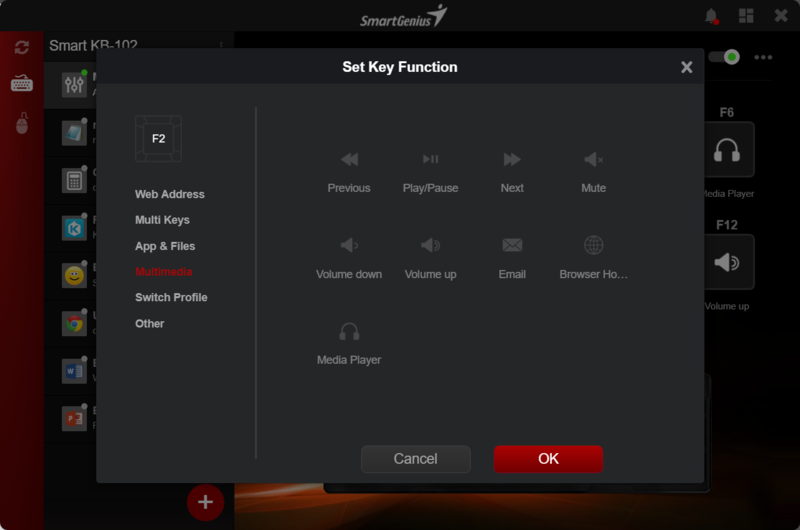 Click the browse icon to select the app you want to add to the Smart Function Key. Or, to select an app quickly, click on the Notepad icon from the Select from list area. Rename the Function Display Name if needed. Now go press the physical key F2 on your keyboard to open your frequently used app. You can even specify free-style keystrokes as if you are keying in the keystrokes when a single function key is pressed, you can follow these steps to assign the frequently used file to a Smart Function Key. For example, I want to open the Windows File Explorer quick, and I know the shortcut key of the File Explorer is “Windows key + E”. 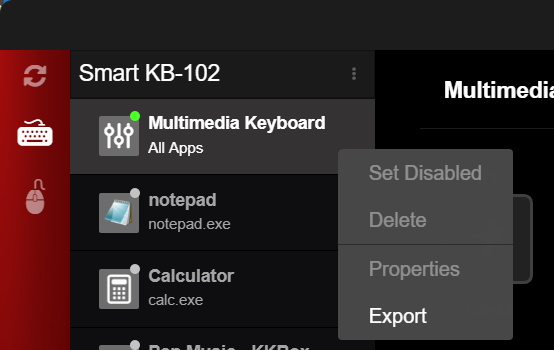 Move your mouse to click on the Multi Keys option on the left panel. Option 2:Type the texts / shortcuts manually. Click (paste multi keys icon) to choose picture which represent this function. 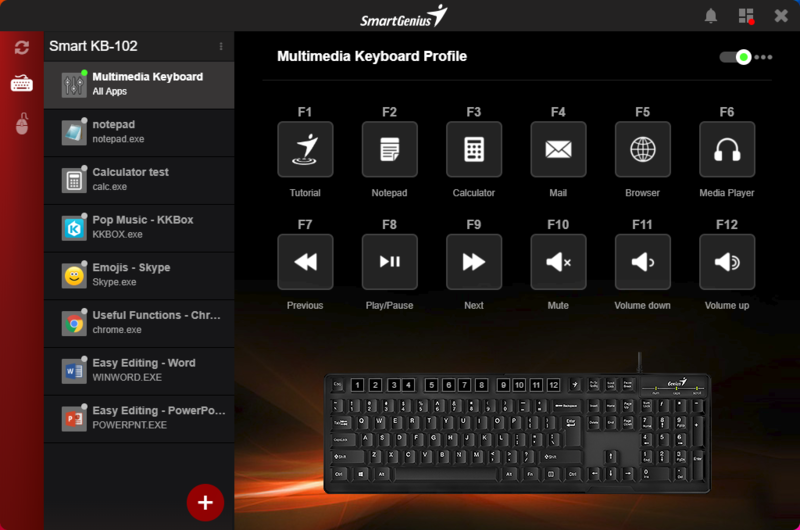 You can use the Genius Smart Keyboard as a multimedia keyboard with more flexibility. Not like the traditional Multimedia keyboards, you can adjust the assignment of the multimedia control to fit your need. Move your mouse to click on the Multimedia option on the left panel. Select a function you want to use. Setting can be saved as a profile. When there is more than one profile for the same application, you can switch between the profiles easily by assigning profile to a key. The concept of Profile will be explained in the next chapter. Move your mouse to click on the Switch Profile option on the left panel. If you do not want to use the predefined function by Smart Keyboard for one key, you can reset the key to system standard function. Hover your mouse on a function key icon (for example, F2) and right click it. The setting of the function keys will be saved as a profile. A profile can be linked with a specific application. The linked profile will be applied automatically when that specific application is running. Click the Genius Profile Center icon. View the details of this profile. Click to confirm the property of the profile. Click to enable the Profile immediately. Now open the Excel app and check the key bar, you will see the Excel – Data Entry Assistant setting will be activated automatically when the Excel app is in use. 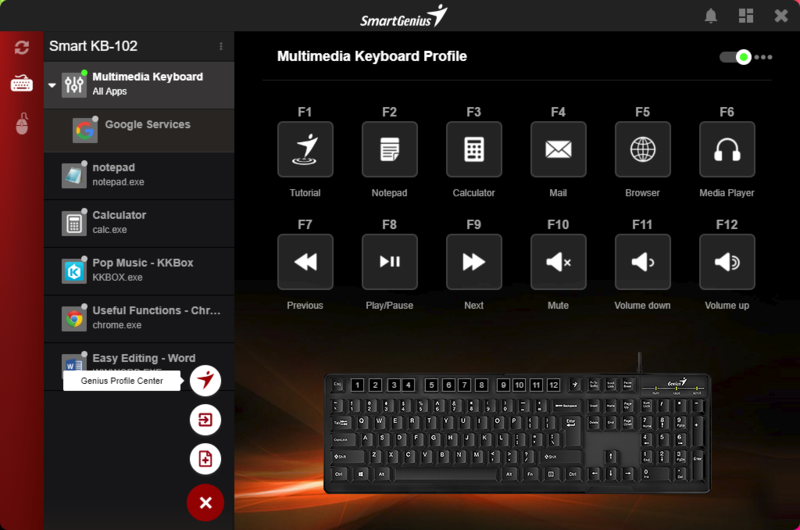 You can create a new profile and add the functions you like to the Smart Function Keys. For example, I want to create a setting for my office work. 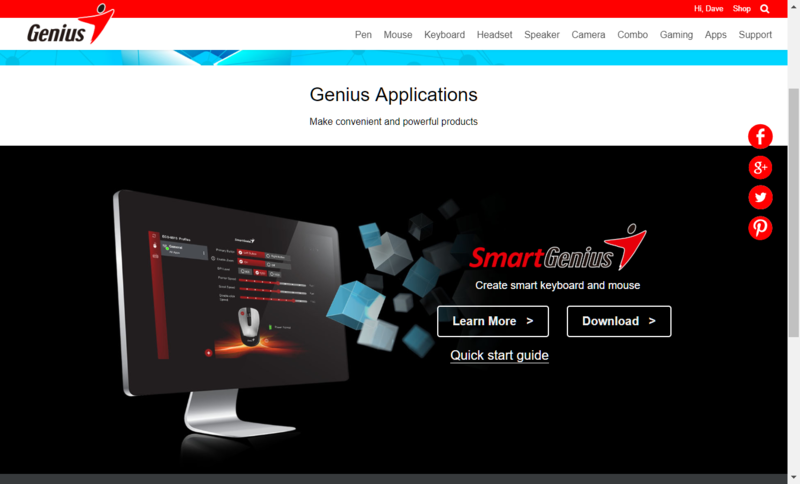 Click the Add icon on the SmartGenius main page. Click the Standard Function icon. Link the new profile with an application. The functions from this profile will be activated automatically when the linked application is running. Option 2: Select For ALL Apps if no application is needed to link (General use). Click on the Panel icon to select an icon for this profile (Optional). The blank profile is ready, now you can add functions to the Smart Function Keys. Note: Only one profile can be enabled for the same application. 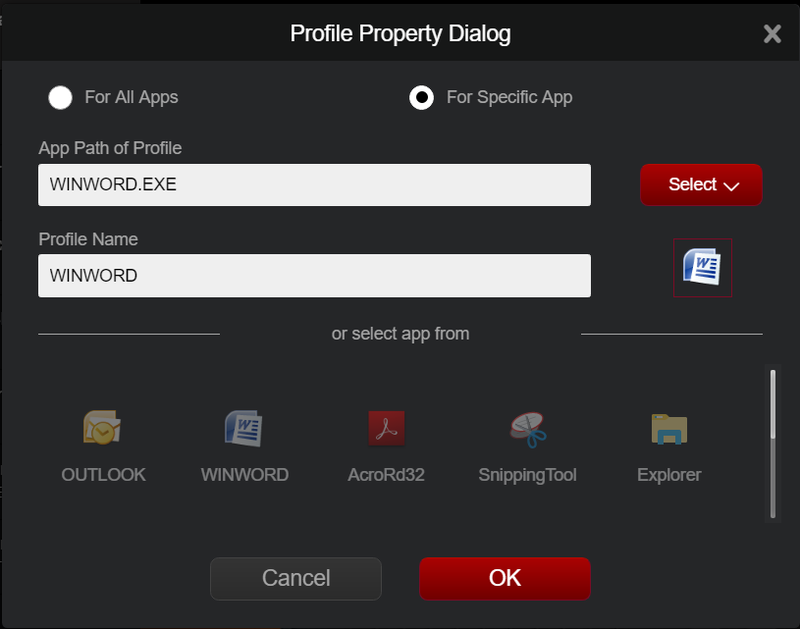 The following screen will appear if there is more than 1 profile for the same application (including All Apps). Setting can be saved as profiles (.gns file). Users can restore the settings / migrate the setting easily by using the export and import features. Click Save ( the profile will be saved as a .gns file). Click Add on the profile area. Select the location of an exported .gns file. Link this profile with an application. 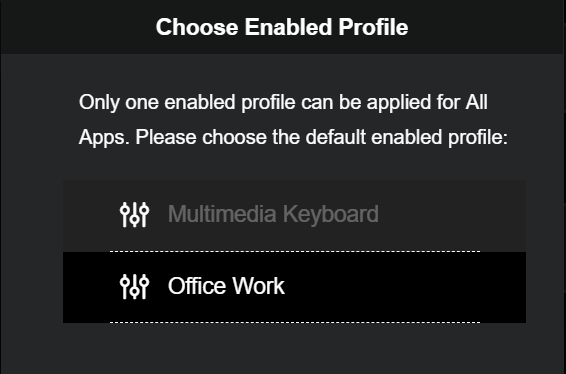 Only enabled profile can be applied to keyboard F1-F12 keys automatically when the profile app is in use. If a profile icon is decorated with green icon , then it is enabled. Otherwise it is disabled. To enable a profile, choose the profile in the profile list and click to make it as enabled . If you want to edit more about the profile, click the profile menu . You can change profile name by clicking profile menu Properties. If you do not need this profile, choose to delete it with profile menu Delete. 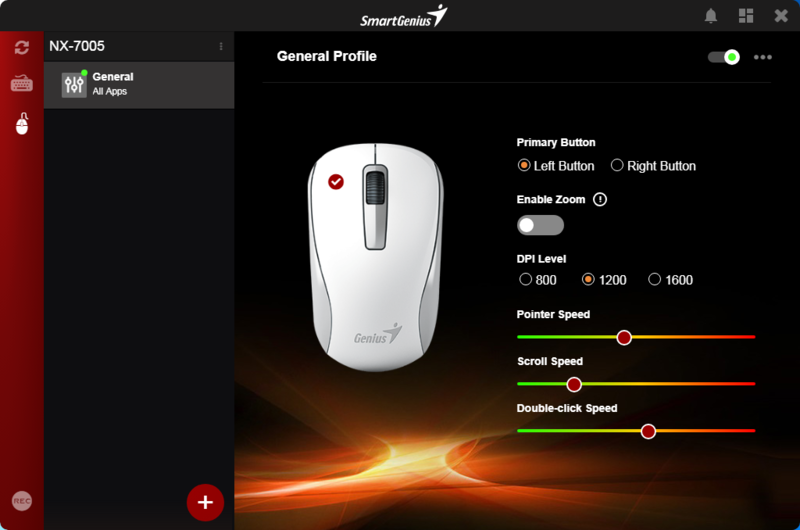 Configure your Genius mouse easily with SmartGenius. Besides the essential features, try out the Scroll-n-Zoom function so you can zoom in and out easily when you are browsing. SmartGenius can customize your mouse for your habit, so you can create a mouse which can work perfectly for you. You can customize Genius mouse for left hand or right hand. As default, the Primary Button is set as Left Button for most right hand usage. By selecting Primary Button as Right Button, the mouse is customized for left hand usage. 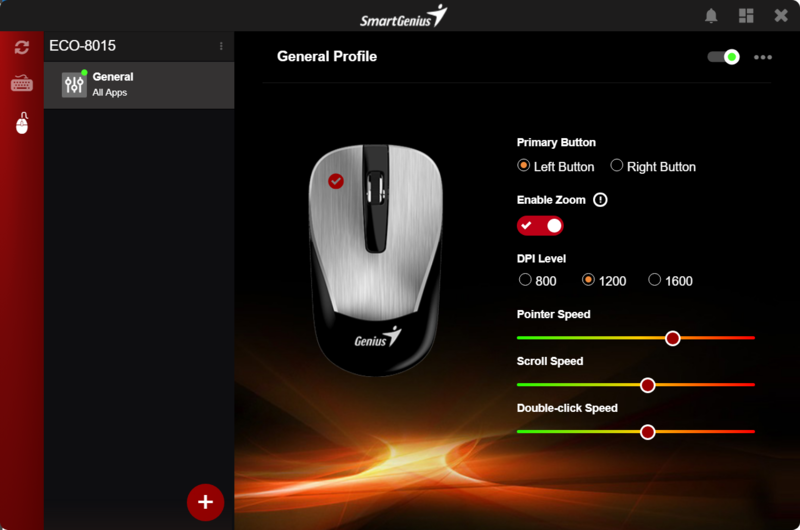 Most of SmartGenius supported mice have multi DPI levels for customization. You can adjust DPI level based on your screen size and your preference. You can also adjust Pointer speed, Scroll speed and double-click speed for your best fit. Please check Appendix to understand how to optimize mouse performance settings. Go to the main page of SmartGenius. Press and hold the middle click button on your mouse, scroll forward / backward to zoom in / out. Besides the customization above, SmartGenius add more for Genius rechargeable mouse. When the battery is low, SmartGenius will alert you with a notification and you can check the battery status from the SmartGenius UI. Never worry battery running out to impact your normal work. Besides acting as Genius Smart Keyboard and Mouse, Genius GX-Gaming Keyboard and Mouse has advanced physical and customizable features. The buttons of Genius GX-Gaming Keyboard and mouse can be customized with advanced Macro function to help you play and win gaming easily. Advanced performance and lighting customization provides you a great and cool Keyboard and Mouse for your gaming experience. Macro is designed to convert complicated or repeated gaming actions with one button press. You can have multi Macros for different gaming actions. 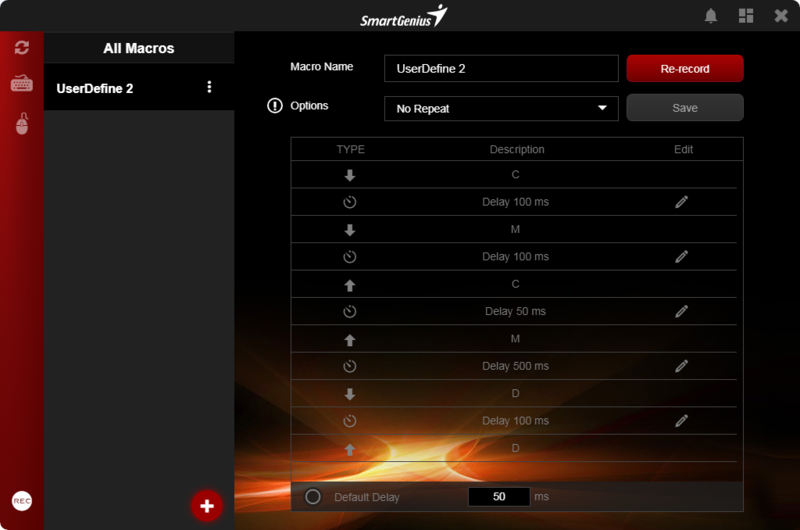 SmartGenius provides Create, Edit and Delete functions to manage your Macros. Choose if to enable Default Delay and update Default Delay value. After Macro is created, you can edit Macro properties or update delay for selected Macro. You can even re-record Macro content. Click menu Delete for every Macro, you can delete the Macro also. The created macro can be assigned to mouse and keyboard buttons. Please refer to Set Buttons with Macro function section. Most of Genius gaming mouse include Left button, right button, middle (scroll) button and DPI Switch button. Advanced gaming mouse include some additional buttons for customization. You can customize all these buttons to mouse functions, Shortcut or Macro functions. For any mouse, you have to keep one button for left click function. Mouse functions include left (single) click, right menu, scroll (middle) click and DPI switch. DPI switch is used to switch mouse DPI to different DPI levels on the fly. You can set mouse button to any one of functions. Every mouse have to keep a Left Click function. Some mice may lock one button with DPI switch functions also. 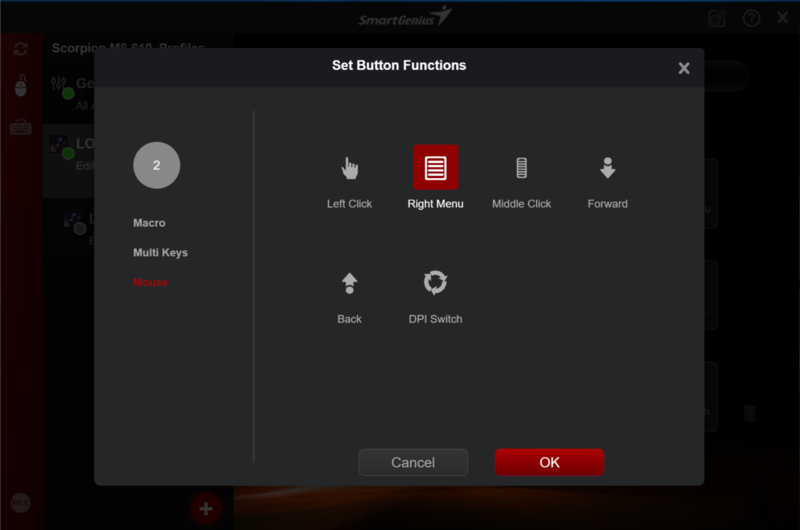 SmartGenius can set mouse button with Macro function. You can choose one defined Macro, or create a new one. To create new Macro, similar steps should be followed as Macro management. 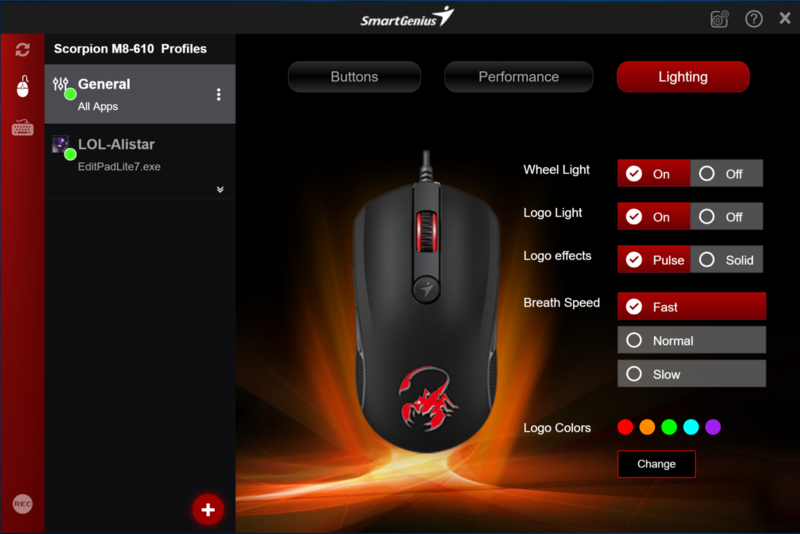 Most of GX Gaming mouse support DPI value customization and you can choose which DPI is applied in device. For some of gaming mice, you can adjust DPI levels also with More settings. Besides DPI, you can also optimize Pointer Speed, Scroll Speed, Double-Click Speed and USB report rate. Please check Appendix to understand how to optimize these performance settings. How to adjust DPI levels by using advanced Settings of DPI? First, plan for how many DPI levels you want to enable for on the fly switching and what is the value for every DPI level. Second, before the 8 DPI level drop-down boxes, enable those levels which are close to your expected value and disable others. Third, If you want to change the value of one DPI level slightly, clicking the up and down arrow to change the value. Another way is to slide the color block in the bottom slide bar to the expected value. Also, if you want to adjust X-Y direction DPI values differently, you can enable X-Y DPI and adjust the values separately. For Scorpion Series Gaming mouse, you can optimize device Lighting settings. M Series mouse is designed to have a Wheel light besides the middle click button. Once mouse is plugged in computer, the light is On with different color which maps to the mouse's current DPI level. When you switch DPI levels, the light color is changed accordingly. This feature is especially useful when you switch DPI levels on the fly while gaming. Please refer to the mapping of DPI level and color through section for More settings of DPI? If you just want to enjoy the performance without light, you can turn off the Wheel light in Lighting settings of SmartGenius UI. The Logo light in the back of mouse provides cooler user experience with LED display. You can customize the Logo light as your preference. The Logo light can set as Breath effect or Solid effect. When Logo light is set as Breath effect, then it breath with specified color. When Logo light is set as Solid effect, then it always show one color specified. What is Breath Speed and Color? If you set Logo Effect as Breath, you can customize the breath color with 7 predefined colors. You can enable any number of predefined colors for Logo light breathing. If you set Logo Effect as Solid, you can customize the solid color with any color. Mouse Logo light will keep the color selected. If you just want to enjoy the performance without light, you can turn off the Logo light in Lighting settings. 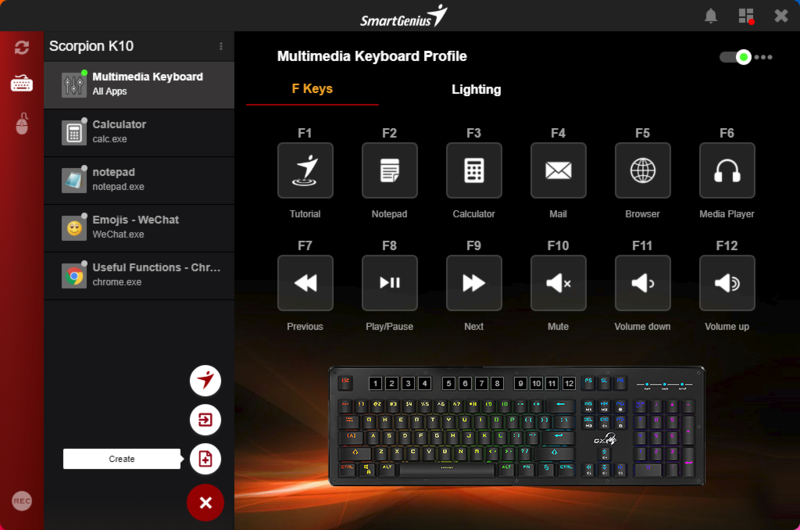 SmartGenius can customize Gaming Keyboard as you customize Genius Smart Keyboard. Please check Here for more details. Besides acting as Smart Keyboard, Gaming Keyboard can also customize keys as Macro function. Please check Here for more details. You are reminded if there is a new version available for update. Wait the update finish. Please not plug off hardware or close App during update. Updating your App gives you access to the latest features and improve app stability. You are reminded if there is a new version available for update. Wait until the update package download is finished, the installation wizard is started automatically. Please not turn off computer or close App during download. Follow the installation wizard and finish new version installation. I have Genius device plugged in, but it is not shown in the App UI. SmartGenius support part of Genius devices. Please refer to here to check supported list of SmartGenius. 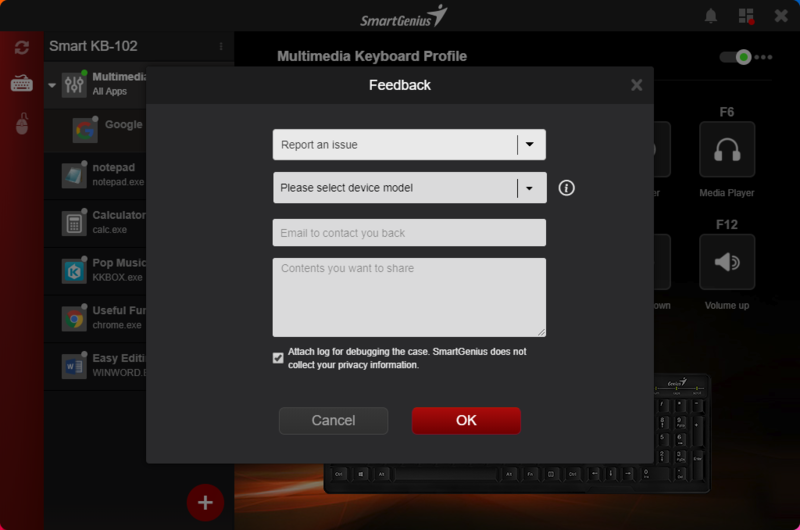 If your devices are in the support list and you still have problem to work well with SmartGenius, please send us a feedback and include debugging information. Somehow, the settings configured on device cannot work correctly. 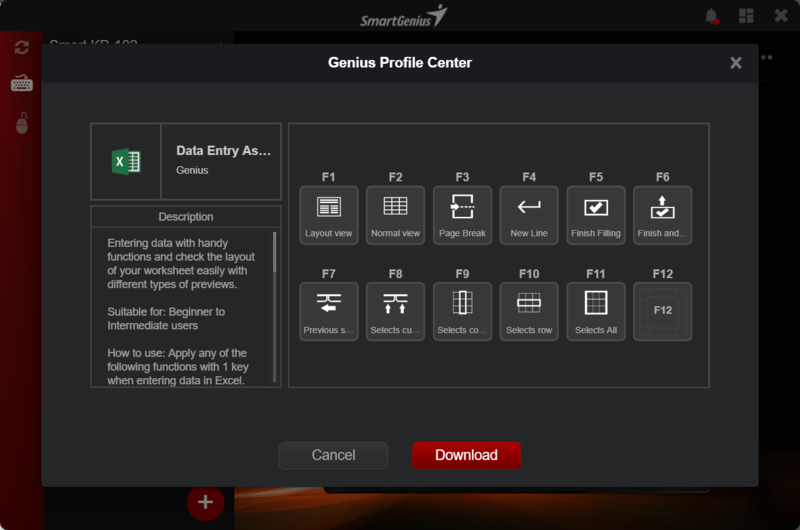 It can be that SmartGenius App is not syncing with your Genius device. Please check if SmartGenius is running in background first. You can try to plug in your devices again and restart SmartGenius. If it is still not working, please send us a feedback and include debugging information. I have a Scorpion M series mouse. When I set Macro with Options with repeated times and assign it to one of mouse button. When I press the button, I find that the Macro function is not repeated. For Scorpion M series mouse, the repeated options cannot be applied. We will add the support for future versions. I have a NX-9000BT mouse. After I set DPI to a different version, it seems not apply to device. Please try not to move mouse when you are setting DPI for NX-9000BT. If DPI is not applied still, please turn off device and turn on again. I have Wireless Slimstar 8008 or Slimstar 8006 combo. Every time I click refresh, one of keyboard or Mouse is not found automatically. Because Slimstar 8008 and 8006 mouse and keyboard share a receiver, so after refreshing devices, only one is found at a time. Press spacebar or move cursor to wake it up so that SmartGenius can find another device. I have latest Mac version and find F1-F12 cannot execute smart keyboard function sometimes. Unplug and plug the keyboard and press related F1 to F12 keys. If you just press keys with function to launch browser or launch media player, open the browser and media player app manually and press related F1 to F12 keys. 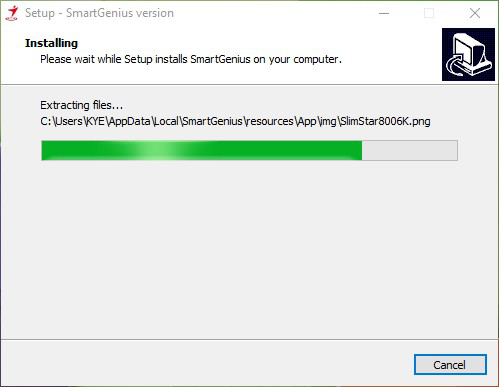 If you still have issues, try to restart SmartGenius. When should you use Feedback in App? We appreciate your usage for SmartGenius App and look forward to provide better service for you. If you have any questions for SmartGenius App itself and cannot find an answer with this document, please let us know. Input your feedback as guided. Please put an email address so that we can find you later. We suggest you include the debugging information so we can solve your problem. Please notice that SmartGenius does not collect your privacy information. How to contact Genius back if I have issues for Genius device itself? Genius Website provides multi ways to help you diagnose your device problem or support. Please go to http://www.geniusnet.com/support. By selecting your product for more detailed support information or contact Genius support, you get better support for Genius device itself issue. "DPI" (Dots per inch) is a measurement of how sensitive a mouse is. Higher DPI means greater precision and smoothness for your mouse movement. The higher the DPI setting is, the faster the mouse detects movement and the more intervals you have. This results in smoothness and precision. It is not always better to use a higher DPI. You don’t want your mouse cursor to fly the entire screen when you browse information line by line. On the other hand, a higher DPI setting helps your mouse detect and respond to smaller movements so you can point at things more accurately. For example, when you play a shooter game with zoomed in sniper rifle, a high DPI could be valuable by allowing you to smoothly aim with small mouse movements. When playing the game without a zoomed in sniper rifle, too high DPI may be too sensitive. For this reason, you can setup different DPI levels for a profile and map a mouse button for on the fly switch. Pointer Speed is how far you have to move the mouse so that the pointer moves a particular distance. A higher speed means that very small movements will shoot the cursor a large distance. Scrolling Speed is how much you have to flick the wheel button so that the page vertically moves to a particular position. A higher speed means that less flicking will scroll page up and down to a specific position. Double Click is about how long the delay time is between the two clicks. A higher value means that it allows shorter delay time between the two clicks, which means you have to click twice very fast. What is USB Report Rate? Report Rate is how often mouse reports its position to a computer. A higher report rate could decrease the lag that occurs between when you move your mouse and when the movement shows up on your screen. On the other hand, a higher report rate will use more CPU resources as the CPU has to query the mouse for its position more often.